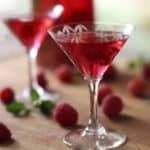 This homemade liquor makes a wonderful gift! The simple recipe comes together in a flash. Add vodka and sugar to a large container with a tight fitting lid. Stir until sugar dissolves. Add raspberries. Store in dark cool place for at least one week and up to 4 weeks. Strain over cheesecloth, chill and serve!